HASTERT, John Dennis, a Representative from Illinois; born in Aurora, Kane County, Ill., January 2, 1942; B.A., Wheaton College, Wheaton, Ill., 1964; M.S., Northern Illinois University, DeKalb, Ill.,1967; teacher; athletic coach; business owner; member of the Illinois state house of representatives, 1980-1986; elected as a Republican to the One Hundredth and to the ten succeeding Congresses until his resignation on November 26, 2007 (January 3, 1987-November 26, 2007); Speaker of the House (One Hundred Sixth through One Hundred Ninth Congresses). Papers: 1981-1986, 4 linear feet. The collection contains correspondence, press releases, and memoranda primarily concerned with contitutents' views on legislative issues and Dennis Hastert's work on various committees and commissions in the Illinois House of Representatives. Organized into six files: Subject File, 1981-1982; Constituents' Correspondence File, 1981-1986; Subject File, 1981-1986 [1983-1986]; Bill File, 1985-1986; Correspondence File, 1984-1985; and Correspondence File, 1985-1986. Papers: ca. 1882-2007, 201 linear feet.. The J. Dennis Hastert Papers are organized into six series and several sub-series: Committee/Subject Files, House Leadership/Speaker files, Correspondence, Personal/Office files, Press files, and Media. Committee/Subject Files include various Congressional committees and issues pertinent during Hastert's tenure in office: Agriculture, Drugs, Economy, Environment, Foreign Affairs, Health Care, Housing, Immigration, National Security, Social Security, Telecommunications, and Transportation. House Leadership/Speaker files include appointments, floor operations, and Republican Conference and Steering Committee issues. Personal/Office files include special events, travel and Congressional Delegations, Gifts & Memorabilia. Media includes thousands of photographs and dozens of audio/video holdings. A finding aid is available in the repository and online. Speaker Hastert discusses the hectic schedules of modern-day Speakers of the House. 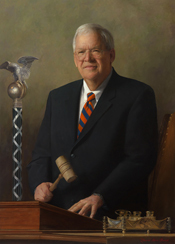 Speaker Hastert explains the symbolism in his portrait. Speaker Hastert recounts his memories from the morning of the attacks. Speaker Hastert discusses his decision to cancel the morning session of the House. Speaker Hastert discusses his familiarity with the buzzer system of the House. Speaker Hastert reflects on the impact of technological advancements on the House.